Just a few quick photos today. I was at Frenchy’s the other day (if you don’t know what Frenchy’s is, it’s kind of like a really excellent Salvation Army store, but better, and in Atlantic Canada). Like, it's not stupid enough? They had to add the "Bro!" to the end of it, just to make sure. First, I saw this gem. Sorry for the poor quality of the photo, but I was using my Blackberry. I felt kind of like a spy — it’s not every day that someone is in Frenchy’s taking photos of clothing in the bins…. 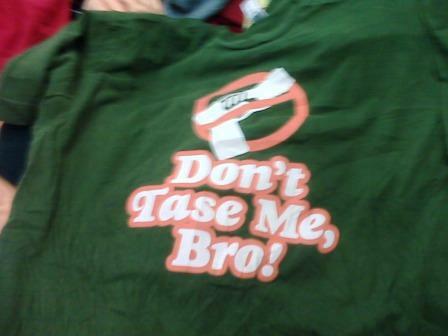 Who can explain to me why this t-shirt is in existence? Who thought this one up? Did some manufacturer have a meeting one day and everyone signed off on this particular design? Did they do market research and discover that the anti-taser demographic was large enough to make this a winning proposition? And just who the heck bought it? Did buyers from Macy’s order it in? Is there a t-shirt version of “straight to video”? Oh dear. Just, um, WHY? So great, right? Did they hire an artist for this? Maybe two? How many iterations of this design were made before they decided that the cop on the right had the perfect googly-eyed look without, you know, looking goofy? 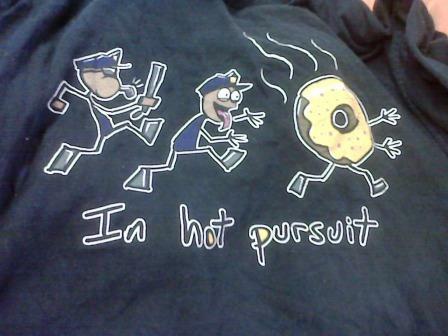 Did they have long rancorous meetings about whether or not a donut has an eyes and mouth? All I can say is, I guess we know why they are now at Frenchy’s.